The machining of pistons is one of the most demanding processes in manufacturing engines and EMAG offers the whole process chain for their complete-machining. The outer contour, in particular, calls for very tight tolerances. Demands are also increasing for production flexibility. For instance, the machine tool used to machine the external surface of the piston must be capable of handling a number of piston variants, not only referring to size and design, but the machines must be able to process aluminum, steel and hardened steel. The piston is one of the quality-defining components responsible for clean combustion and the longevity of an engine. 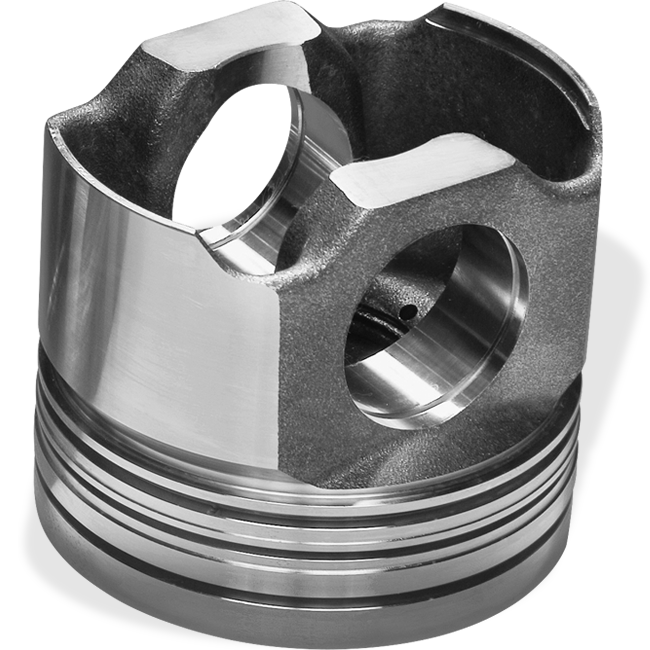 The optimization of combustion chambers leads to ever more complex piston designs tailored to suit the demanding conditions encountered in the chamber. Usually, piston are designed using experimentally defined cams frequently created on 3D CAD systems, as these allow for the finite behavior of the piston to be investigated as early as the development stage. The manufacturing system from the EMAG Group is capable of machining every shape of a piston. The contour is both freely programmable and definable with the help of a point cloud. It allows the designer to tailor the piston to suit the engine without having to give special consideration to the machining process. Additionally, the geometrical data derived from the 3D model can be transferred directly to the machine, where the control automatically generates the relevant NC program for the machining process. This drastically reduces the resetting effort for new variants. The piston manufacturing system consists of duplicable single-technology machines with integrated machining processes. Division of these processes over a number of machines of the same frame size results in a high degree of availability (OFE 80%) and simple, easy to follow procedures. The machine availability is not reduced by scheduled tool changes.